From magnetic field observations by CHAMP we estimate F-region dynamo current densities near the sunset terminator during solar maximum years from 2001 to 2002. The dynamo currents are compared with the pre-reversal enhancement (PRE) of vertical plasma drift as observed by ROCSAT-1. The seasonal-longitudinal variation of PRE can be largely related to the F-region dynamo current density, with the correlation coefficient reaching 0.74. The correlation can be further improved if we consider a zonal gradient of the E-region Pedersen conductivity, which also depends on season and longitude. It is widely accepted that the Fregion dynamo drives PRE near sunset. For the first time, our observations provide confirmation for the close relationship between the F-region dynamo current density and PRE. 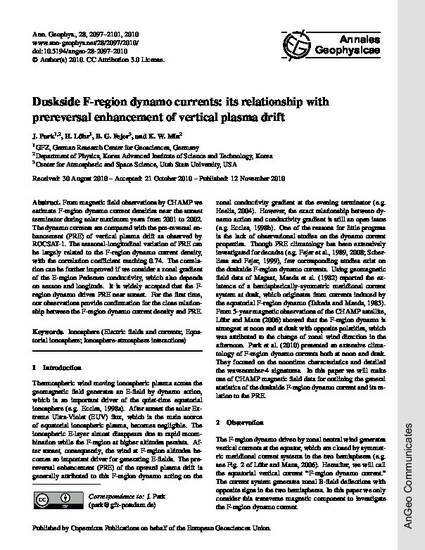 Park, P., H. Lühr, B. G. Fejer, and K. W. Mim, Duskside F-region dynamo currents: Its relationship with prereversal enhancement of vertical plasma drift, Ann. Geophys., 28, 2097- 2101, 2010.